Faffcon has given me many things professionally over the years but probably one of the best things it did was introduce me to Pandora. 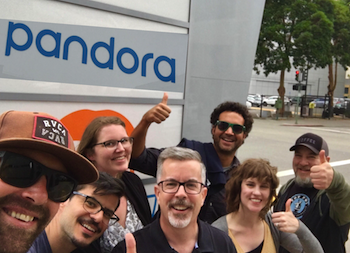 Pandora — as the best music and media service around — is known by just about everybody. 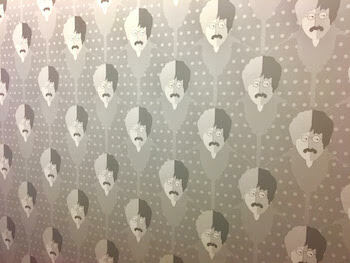 But not everybody knows about the exceptional talents that manage Team Audio. These talented women and men have produced (and continue to produce) some outstanding advertising. I am thrilled that I have been a VERY small part of some of their great audio branding. Well this week, I got to see their HQ/home in Oakland and what an amazing place it is. You would expect a super creative company to work in a super creative environment and that is especially true at Pandora. If all offices created workspaces as cool as this…people would be a lot happier at work. The best part of course, were the people of Team Audio, many of whom I’ve been proudly working with virtually for many years on many spots. They are each nice, cool and uniquely creative. I’m so honored and glad we got to spend time together. A great company with great people….which is what makes it a great company. Thanks to everyone at Pandora! In the good old days, a voice talent could simply post their new voiceover demo on a web site, email the demo to his/her agents and carry on. Well, I just finished recording and updating my new political voiceover demo for the mid-term General Elections in November. There should be a good amount of political voice work for voice talents between now and November. I posted it to my web site and sent it off to agents but this time I added the extra element of producing a video that featured the demo. No, Ken Burns is not shaking in his boots following this release of this new, epic voiceover demo video. It’s produced with some graphics that I crafted that match the theme to make it listenable and viewable. Just before the internet got popular, I graduated from college with a degree in Radio & Television from the University of Dayton. We worked on ¾” video tape and reel-to-reel audio editing. I owned a video production company for 6 years after college and edited lots of videos. So you would think, with that kind of experience, that I should be able to handle something as “simple” as iMovie to slap together this little video. Further, you would think Apple would create a software that was extremely intuitive and easy to manage. You would be so wrong on both counts. Apple is not as cool, sleek and smart as they want you to think they are. You already know that I’m not. Be that as it may, I imagine I will be dancing again soon with iMovie and producing a few more epic presentations. Please don’t throw tomatoes at the screen. RALEIGH, NC, August 1, 2018 – – Ahead of the U.S. 2018 General Elections for local, State and Federal political races, America’s Friendly, Neighborhood Voiceover Talent is ready with a new demo. 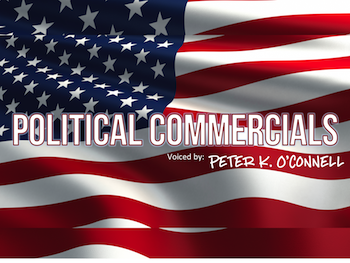 Male Voiceover Talent Peter K. O’Connell has released his updated political commercial voiceover demo, allowing media producers and political consultants involved in political campaigns for the upcoming mid-term elections to sample his updated commercial styles. The updated, multi-track production of his new political demo was completed at O’Connell’s studio, audio’connell Voiceover Talent. The studio headquartered in Cary, NC just outside of Raleigh. While not aligned with any political party, O’Connell voices political commercials solely for candidates who fully support the Pro-Life platform. 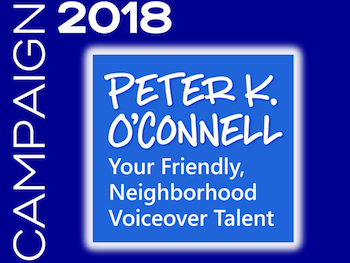 From Fortune 500 companies to companies that think $500 is a fortune, multi-award winning male voiceover talent Peter K. O’Connell has shared his voiceover skills with a wide variety of global companies. In addition to his political voiceover work, some of Peter’s clients include IBM, Duracell Batteries, General Electric, Kraft Foods, Western Union, PBS Television Network, Shell Oil, Deloitte Canada, U.S. Army, Starz Cable Television Network, BlueCross BlueShield and SunSetter Awnings. Originally from Buffalo, NY and now living in Raleigh, NC, Peter owns audio’connell Voiceover Talent, a division of O’Connell Communications, LLC. Peter can be reached via audioconnell.com or peterkoconnell.com.